I am trying to "clean up" by BeaTunes 5.1.8. For testing purposes, over time I have created a number of "new libraries" that are really just a small subset of my overall music collection. Now I'm ready to point BeaTunes to my whole library (which is actually two separate, non-nested folders). Before I do that (which means messing with the preferences2.xml file as described elsewhere), I would like to get rid of all the previous "libraries" I set up. I don't want to delete any mp3 files. Just the unneeded library structures. to delete a library, just select it in the general preferences and then click on the [-] button below it. Thank you, Hendrick. I didn't think to look there. So I went to General Preferences, clicked on the list box, selected the first library alphabetically (which is one I want to delete). 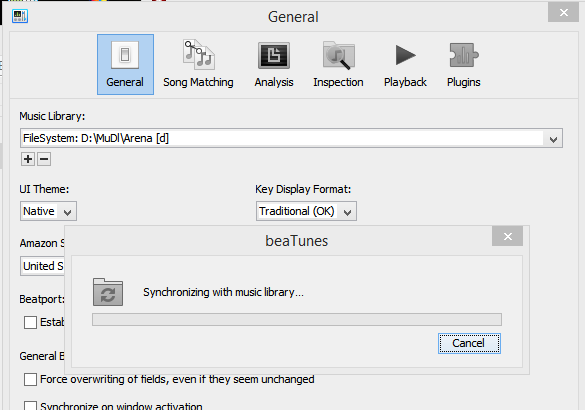 It pops up a dialog box saying that it is Synchronizing with music library... and there it sits doing nothing. Yes, the folder that the library points to still exists and has music files in it. It has 1 artist and 1 album with 14 tracks. It's been sitting there for 10 minutes with nothing going on in the progress bar. Ideas? Update: If I press Cancel on the dialog box, it doesn't do anything. Same if I press the "close window" X in the upper right. The app is frozen. "Hung" now for 20 minutes-plus. I'll have to terminate the task in Process Explorer (Task Manager-type app). I restarted beaTunes and tried to delete the library it was already on. That worked fine. Then I deleted the next one that popped up. That worked fine, too. But when I went to select the one I first tried to delete, it hung again. Either something about that particular library it doesn't like, or it can't change libraries. I restarted beaTunes and this time selected a different library in the Preferences (not the one that it was hanging on before). Same thing: it hangs if I select a different library than the one that comes up when I start up beaTunes. Is it possible that the problem is something simple like beaTunes doesn't like certain kinds of folder names? And maybe that was something that was introduced in an update that came in after I had created those libraries? My folder naming convention is to place music into the D:\Rips folder (for music I rip myself) or the D:\MuDl folder (for music I download). And then the subfolders get the artist name, except for the MuDl subfolders I append " [d]" to the folder name just to make it easier to distinguish folders for the same artist that appear under my two top level folders. I notice that beaTunes seems to have a problem with all of the libraries that are based on a folder with a "[d]" in the name. See screen cap below of all of my remaining libraries. When I try to delete the "10cc" library, it appears to do so, then it tries to access the "Arena [d]" library and gets hung. When I terminate & reopen beaTunes, it goes back to the 10cc library. So it didn't actually finish deleting that library, I guess because it had no viable alternate library to go to? Ah—usually when you select a library beaTunes syncs. That does not make a lot of sense when you just want to delete it. Hendrick, I can do that as a workaround (removing the entries from preferences2.xml). But doesn't that indicate a problem nonetheless? What if I really wanted to make one of those folders my library? beaTunes hangs when synching in the course of switching to it, so I couldn't designate one of those as my library even if I wanted to. Just sayin'. Also, as part of the workaround, should I delete the h2 and trace db files corresponding to the libraries I'm deleting from preferences2.xml? Yes, you can delete the corresponding h2 files.